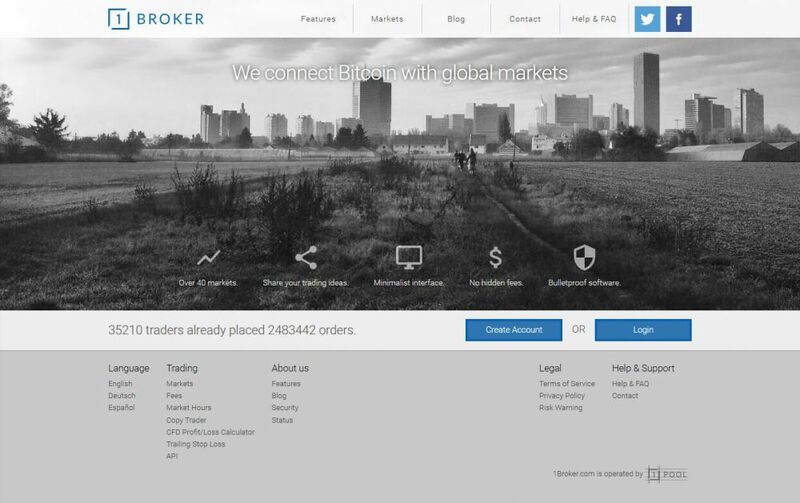 I’m sure that you have already heard about 1broker.com if you are familiar with the cryptocurrency world. This website has been operating since 2012 and has been servicing people from around the world by providing them a trading platform designed by people that use cryptocurrencies. Today, we will be creating an account with them; try and look if we can do some sample trades, and look into the features that they have for us to try out! The website supports English, Deutsch, and Spanish Languages for our European non-English speaking friends. Their company office is located in Ajeltake Road, Ajeltake Island, Majuro, Marshall Island MH 96960. Unfortunately, the website is not regulated by any Regulating body compared to other trading platforms that we have running today. If that makes you uncomfortable, then this is not the website for you. If you like anonymous trading, then let us proceed! After that very fast company introduction, let us jump right into creating an account with 1Broker.com. To create an account, we, of course, need to head unto their website and click on the “CREATE ACCOUNT” button which can be found on their homepage. In order to create an account, you just need to provide a username, a valid email address, and the password for your new account. Once this has all been filled up just click on confirm and a confirmation email will be sent to your email address provided. 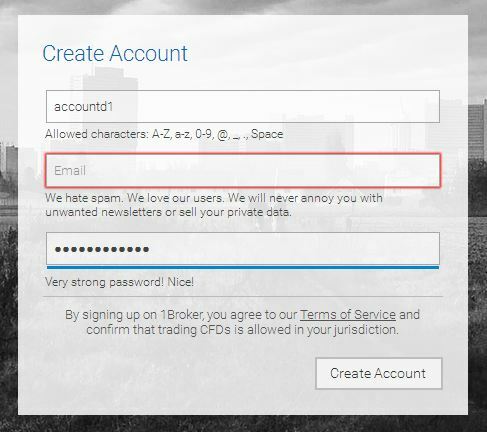 Please be advised that 1Broker.com confirmed that sometimes you might get your confirmation email sent to your spam or junk folders. If you are not able to find the confirmation email in your Inbox, make sure to check on the mentioned folders. Once the confirmation email is found, click on the link to activate the account. You will then be redirected to your account page. The first thing that you will be seeing is tabs for “Popular Traders” and “Successful Traders” which would easily look like a Social Media account. We will be looking into these features later on in this review, for now, let us figure out how to trade. The first thing we need to do is click on the “Markets” tab located on the upper right portion of your account page. Click on the market that you want to trade with. You are able to choose from Stocks, Indices, Commodities, and Crypto trading. Today, we will be trying out crypto trading of course. Unfortunately, once the BTC/USD pair was clicked, there was a prompt saying that their crypto trading has been closed since May 25th, 2017 which disables their ability to trade with cryptocurrency and advises to use 1Fox.com for future trades. Anyhow, that is a different story for a different time. Since we are unable to trade with Crypto, let us move to the next best thing, which is Forex trading. Click on the pair that you want to trade with, today let us try AUD/NZD pair. If you want to Short the pair, just click on the red box and if you want to go long then click on the blue box, both of these selections will open up a separate tab wherein you are able to check and tweak everything to your advantage. The first box shows you the amount of BTC that you are willing to invest on a trade. You will also see the current BTC: USD ratio shown on the far right corner of the tab. On the lower part is where your position and leverage of the trade will be located at. Maximum leverage tried was 1:500 and minimum are 1:2. You are also able to change your stop loss and profit specifications here. 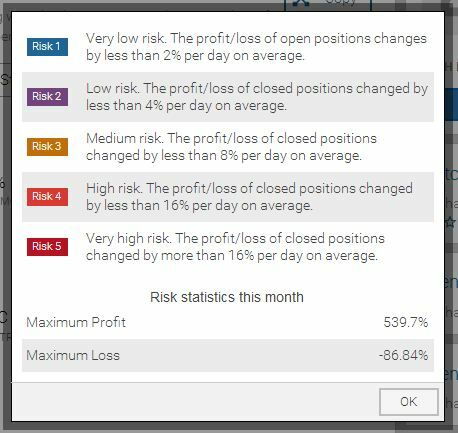 Other features include a Proft/Loss Calculator which would come in handy if you want to magnify your losses and profits to make better choices for your trade. You are also able to share your trade by clicking on the “Share Trade” box located on the upper right corner of the tab. What would this do? This simply shares the trade that you will be doing. Remember the Social Media comment I mentioned earlier? Well, this is related to that. Please be advised that there are no Demo Accounts that you are able to use and try a practice trade with. 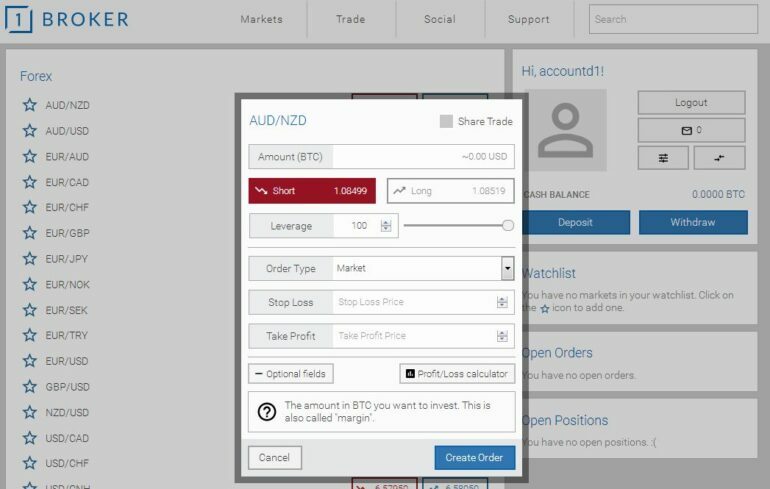 If you want to trade with 1Broker.com, you first need to deposit Bitcoin into your account and start trading with them. In addition, to read more about their updates and current spreads, please click this link. What makes a trading platform unique from any other ones that you have been to? That would be their features! Here at 1Broker.com, you are able to copy trades of the masters here at 1Broker.com. Try clicking on any name listed in the Social Tab. Let us try out “snortex” from the Popular Traders tab. After clicking on the name, this will bring up a separate window with all the information regarding the popular trader we have chosen. Here you are able to copy their successful trades that they have done over the past months. The “Copy” tab shows all information needed like Amount per trade that you want to copy and the maximum trade limit you want to give. Please make sure that you have enough funds in your account to copy a trade with the maximum allotted trades per day. How do you choose a successful trader? Every trader has a Risk level clearly shown below their account profile. The risk level runs from 1 to 5, the higher the number, the higher the risk but the higher the payouts. Click on the risk level of the copied trader and see the explanation per color. Pleae be advised that when copying a trader’s trade this will cost you 2% of the traded value. Since we have covered the important parts of creating an account and trading, it is time to know how to get money into your account. The only payment method available here at 1Broker.com would be Bitcoin, this means that they only accept and allow Bitcoin transactions for both deposits and withdrawals. For a deposit, the system will generate a unique Bitcoin Address for your account. If you want to withdraw funds from your account, all you need to do is click on Withdraw and provide your Bitcoin wallet address along with the amount you want to withdraw. Please remember that they charge a withdrawal fee of 0.001 BTC which is most likely the Bitcoin network fee and not a direct charge from the website. For all other Fees being followed in 1Broker.com, please click on this link. What I do not bluntly like about this website is their inability to provide an excellent customer support options to choose from. They do have an email customer service channel which promises to reply back to your concern within 24hrs but that’s it! They need a direct phone support or even a live chat service where you are able to connect with them anytime of the day. They say that customer service support is a vital part of a website, and I confirm that is true! Without a proper channel of communication, your services will be next to nothing. 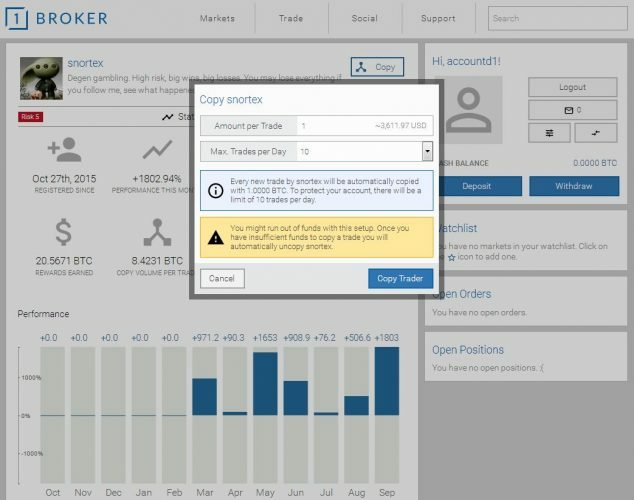 If you are a trader that loves to play with cryptocurrency and sets anonymity to its highest level then 1Broker.com is definitely the trading platform for you. The trading platform is crisp, no lags were experienced during the account creation and test purchase and the website automatically refreshes every couple of minutes to ensure that you are getting the latest trends updated. 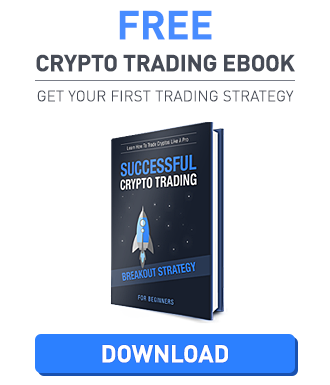 They also have the “Copy Trade” feature which I really like since you are able to copy successful traders from professionals that have been doing it for months. This can also work for professional traders as they are able to share their trade with new comers. Customer Service needs a lot of work, but overall, this website isn’t so bad at all. This is an unlicensed exchange that does not give a crap about its users. If there is a trading blackout, and you sure can expect one here, you will lose money and they will profit. Recently, they had a 30-minute blackout on the USD/TRY pair and many people lost money. Other websites with that pair did not have a blackout and there was strong volatility. It looks awfully suspicious and interestingly, despite the blackout clause in their TOS – no users were refunded.